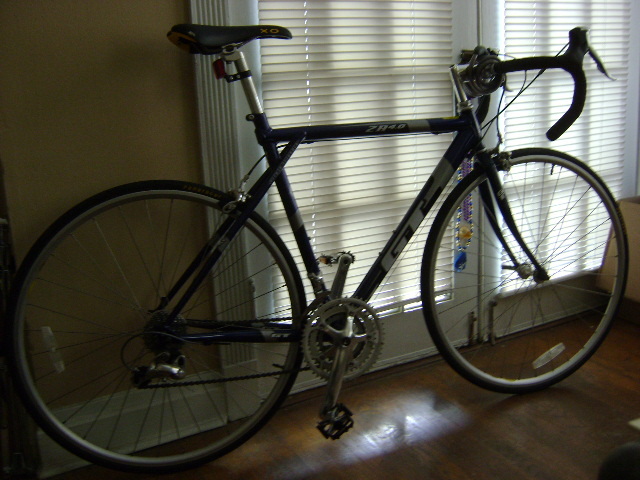 So, my good friend John C. loaned me this gorgeous GT road bike a couple of weeks ago cause I was going on about how I needed to get back into shape and bike riding is great exercise. Here I am spinning around midtown like I’m Lance Armstrong or something, going from sitting in front of my computer for hours on end, to full-on 20-30 minute jaunts without any warm-up and WHAM-O! Pinched a dang nerve in the back of my neck and can’t even play a frickin press roll. Tendonitis. What a pisser. Luckily, I found a lady named Myra who does some amazing physio and says she can get me back to 100% in just a few visits. Wish me luck. I’ve got 24 gigs this month!